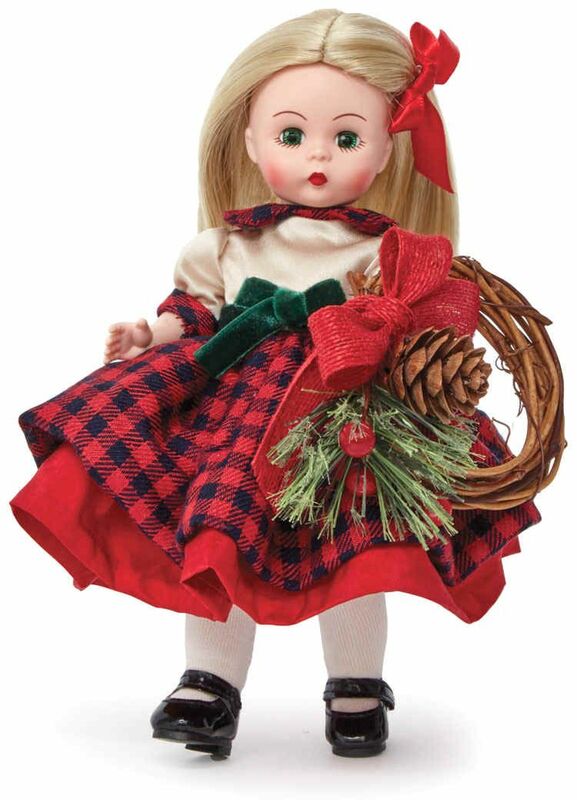 Cabin Christmas 75145 by Madame Alexander Cabin Christmas Wendy will fill your heart with Holiday cheer! She has even made a gift for you: a small Christmas wreath. If you have a doll house, it just might fit perfectly on the door! Wendy is 8 inches, made of vinyl and fully-articulated with jointing at her neck, shoulders, elbows, waist, hips, and knees. Her rosy cheeks and blue eyes are framed by a long blonde wig. She wears her new Christmas dress with a satiny yoke and 2 layered skirts of red and checked fabric. A velvety green ribbon encircles her waist. White stocking and black mary jane shoes complete her Holiday finest. Cabin Christmas 75145 is part of Madame Alexander's Seasonal Collection. Suitable for ages 14 and up.